I got a chance to grab and read Ravana’s Sister (Meenakshi) recently, as a book promotion was running. It is a very short EBook (just 14 pages) which you can read within half an hour. The question is, whether you should read it? If you love to explore Indian Mythology, recently it started flowing books in the zone. As Anand Neelakantan is famous for looking at the story (be it an epic) from the different (precisely, opponent’s) perspective; his books let us explore Ramayana from Ravana’s point and Mahabharata from Duryodhana’s perspective. So let us explore what it has to offer in this book. As you can see the cover page is an illustration of a lady with beautiful eyes which reflects the book title pretty well. Meenakshi means, the one with the beautiful eyes like that of a fish. For both the other books in the series, the front pose of the illustration of the protagonist was depicted and it was not centered. This time a side pose has been explored, and thus cover doesn’t look imbalanced. Overall, a simple book cover. Let us take a look at the plot of the book. 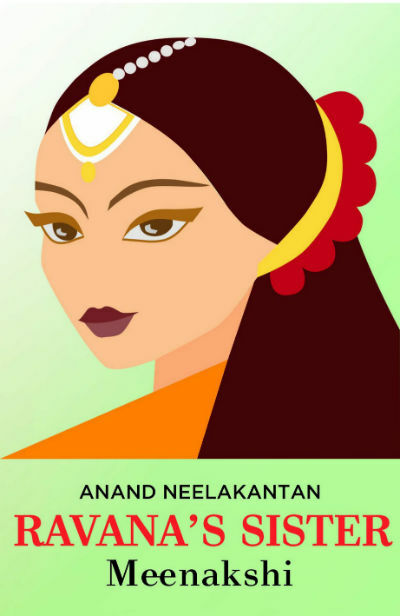 It explores the feelings and experiences of Meenakshi, a sister to the three angry brothers, whose humiliation was one of the main reasons of the fall of Lanka. Meenakshi is aged and unrecognizable now. The memories of her early life are still with her. How can one get detached from the memories? Is it possible? What does she feel about her brother and his actions? What does she feel about the people living in poverty? Will she be able to console her inner-self? What does Sita mean to her? Was she witnessing the “ideal and peaceful time” of ruling by the perfect ruler? Well, everything is explored in this small 14-page emotional tale. When the story itself is short, telling more about, or exploring the incidents mentioned within, is nothing less than spilling beans about it. And, once you know the content in its entirety, you will lose the charm of reading it. From the title of the story/book itself, I was expecting to explore the unknown facts and other details about the protagonist. I am disappointed in that aspect. The story, of course, has a few references to Meenakshi’s husband, his death, and a couple of other life-changing incidents, but it is not much more than a mere mention. So the book is a disappointment if you are keen to explore the tale of Meenakshi which is rather famous by another name. She paused to smile at them, but their feet carried away their happy yells before she could even blink. She was just so insignificant, much like a worm. The the “ghost of a nose” itched yet again. She wasn’t scared of dogs. She had seen worse — human beings who could bite without even the warning of a bark. I become philosophical when my stomach is half empty. It is a disease. I like the wordplay in the book where the female protagonist talks about the winner and the loser of the deadly war (at different points) in an almost same way, she was responding to the remarks that the king referred seems to be a cruel king. Not really. He was just protecting his property. Ultimately he lost it, so people call him evil. Oh, he was also protecting his property, you see. He won, so people call him God. The following line is written in the context of the time explored in the book, but don’t you think it fits in today’s situation as well. The “yesmen” roaming around the power holders is an absolute truth :). Poets are seldom wrong. They sing to the tune of money and to the rhythms of power. ‘What did you do to anger your lover? I liked reading references of fragrance coming at almost regular intervals. Knowing about Meenakshi’s character you will understand it’s context also. While there are sorrows and grief explored throughout, the book is not about pessimism. The book doesn’t try to explore a tragic story either. It tells all about the optimism and positive thinking. The conversation between two leading ladies of this book where they talk about the war is worth reading. The author proves that there is no need to do male bashing or even “pseudo-feminism” to explore empowered female characters. You can talk about any gender’s shortcomings as well as strengths in a realistic manner without being abusive. You will like to read the way the book ends, the last scene is a metaphor for many things, just give a free way to your imagination and you will enjoy. The book is not the biography of Meenakshi and you will be disappointed if you want to explore it that way (as the name of the book suggests). In terms of linguistic stuff and reading experience, it is fantastic. And the price at which it is available when I am writing this review is just Rs. 5 (USD: 0.08), so worth it.